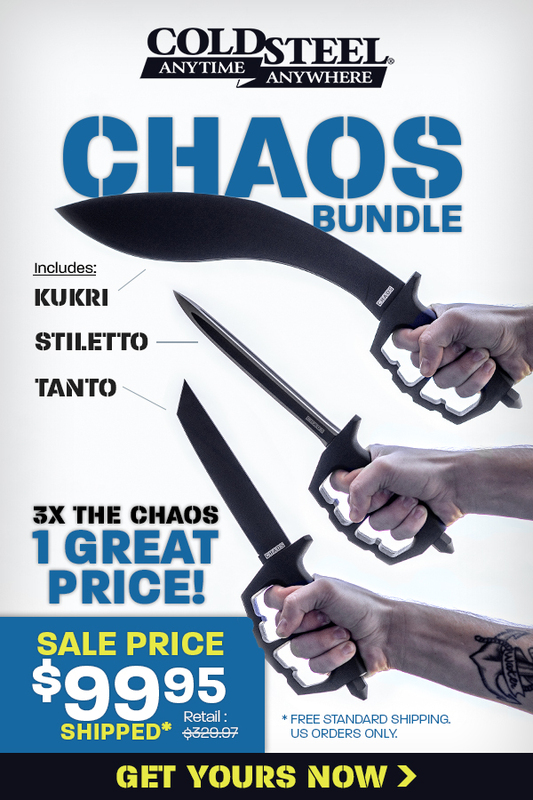 3x the Chaos – NEW Cold Steel Holiday Bundle! You’ve seen Cold Steel’s Chaos Stiletto go head-to-head with our buyer Jason’s steel fender. You’ve witnessed the carnage the Chaos Kukri can wreak in the wilderness. You watched the Chaos Tanto deal serious damage to a pick-up truck. Can you imagine all that power in one awesome Black Friday bundle? Three times the Chaos, one great price – only $99.95 (shipped anywhere in the US) for three incredibly tough, high-performance knives. You can keep all three for yourself, divvy them out amongst your friends, or give the whole bundle to someone who is going to put that hard steel to work. This three-for-one deal saves you hundreds of dollars! Cold Steel is known for making blades that are overbuilt and can take one heck of a beating. Inspired by the greatest fighting knives in history, their Chaos Series of fixed blades lives up to that legacy perfectly, combining maximum safety and security with extreme performance and combat potential. For the best holiday deals and gift ideas this season, head over to KnifeCenter.com! This is just the tip of the iceberg – we’ll be putting out deals every day with awesome discounts that are sure to make the season bright. $99.95 for Shun’s Best Chef’s Knife – Only Four Days Left! Heya! I’m at work browsing your blog from my new iphone! Just wanted to say I love reading through your blog and look forward to all your posts! Keep up the fantastic work! Never knew this, thanks for letting me know.